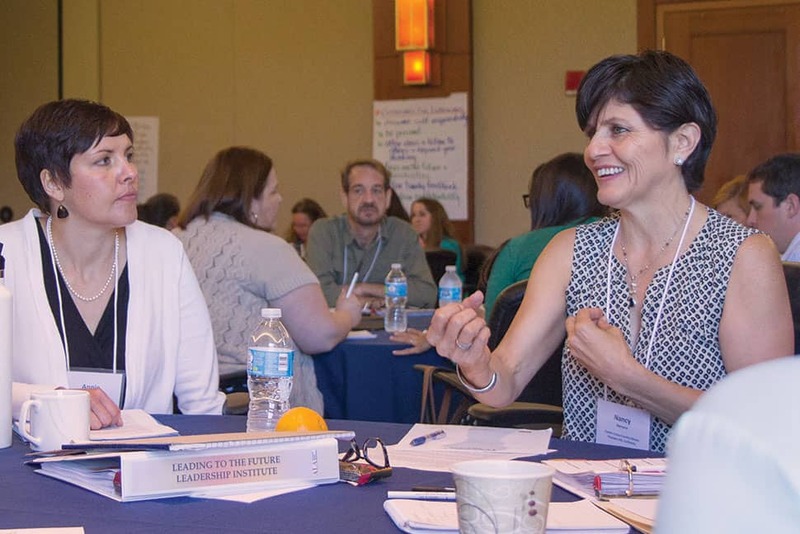 For four years, ALA’s Leadership Institute has offered midcareer librarians the opportunity to take part in a four-day immersive leadership development program. The goal, says former ALA President Maureen Sullivan, is to introduce theories, concepts, and practices for effective leadership and “help people develop self-awareness of their strengths and areas for development.” Sullivan, who developed and leads the institute with library consultant Kathryn Deiss, says the institute accomplishes this goal with a mixture of presentations, small group work, and self-reflection. The 2016 institute class, led by Deiss and Miguel Figueroa of the ALA Center for the Future of Libraries, experienced a new exercise: an opportunity to imagine how current social and technology trends might be reflected in library services of the future. Working in small groups, institute participants developed ideas that ranged from an augmented reality app that could find library materials to automatic drone-based delivery of material on topics of interest to ways to use the library to improve social equality. The 42 participants then focused on how their innovations would change a library’s relationship with its users. “Our group broke down the augmented reality app to turn it into something functional for library users by basically having the device walk them to where a book is,” says Carrie Betts, information and technology specialist at Birmingham Public Schools in Bloomfield Hills, Michigan. 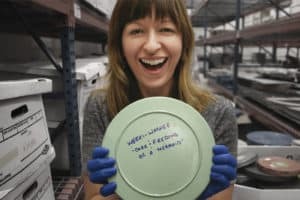 Because the app would locate items based on their RFID tags, patrons could easily find materials even if they are misshelved, on a table, or in a return bin. Similarly, drone-based delivery may not be practical for a few years, but the group that proposed that idea realized that its core is similar to subscription boxes like Blue Apron or Loot Crate. “Patrons could sign up and librarians would be responsible for selecting materials based on their interests,” says Tomika Price, senior librarian at San José (Calif.) Public Library. Erica Freudenberger, outreach and engagement consultant for Southern Adirondack Library System in Saratoga Springs, New York, says that after leaving the institute, she and other participants discovered that a librarian at Purdue University’s Black Cultural Center Library in West Lafayette, Indiana, had begun a similar service that highlights the work of black authors. That librarian, Jamillah Gabriel, created Call Number, a service separate from the library. The group has since been sharing articles and other information about how the subscription box concept might be adapted to a library environment. The visioning exercise is only one part of the institute’s rigorous programming. “We start with a focus on the individual,” Sullivan says. Participants begin with a self-assessment to identify areas of strength and areas for development. From there, the program moves toward understanding the work of a leader within an organization, and finally it focuses on the leader’s work in the community—whether “community” refers to a city, town, college campus, or school. The agenda includes presentations, exercises, and an opportunity to tackle issues specific to participants’ current situation. “[For a case study] each person brings in a description of a situation they’re facing as a leader,” says Erin Shea, supervisor of the Harry Bennett and Weed Memorial and Hollander branches of the Ferguson Library in Stamford, Connecticut. Shea agreed, observing that before attending the institute, her instinct was to fix issues immediately as they arose. “It led to me feeling as if I was in the weeds all the time,” she says. Since the institute, she has shifted her focus to providing staff members the tools they need to meet challenges so she can focus on the library’s overall direction. The experience also helped attendees gain confidence in their leadership abilities and overcome “imposter syndrome”—the common and generally false sense that achievements are due to luck or deception and that the “truth” could be exposed at any moment. Price says the group discussions helped her come to terms with what had been a thorny relationship with an employee. “I was stressed about making the relationship work, but it wasn’t actually about me.” Instead, that employee’s needs were better met in a different role in the organization. Through the group discussion, Price says she realizes that the difficulty of the relationship might even be a good sign, because the employee knew she could be honest about how she felt. The institute has also helped participants make changes in specific practices. “I’ve started having weekly check-in meetings with my staff,” Shea says. That was a step she had resisted out of concerns of having too many meetings. “But I realized those meetings can be just five-minutes long to see how they’re doing and if there’s anything they need.” Shea has seen how those meetings have opened lines of communication with staff, which had been a special challenge since she manages two branches and may not otherwise see everyone regularly. Freudenberger has since used her institute experience as part of the New York Library Association’s Sustainability Initiative. 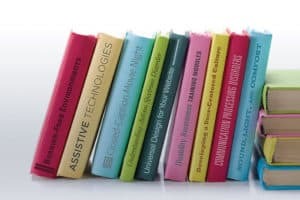 “We’re working to develop a yearlong training program to help people think differently about how we do library work, keeping in mind the triple bottom line of sustainability: economic parity, environmental responsibility, and social justice,” she says. Another practical benefit of the institute is that each year’s class becomes a network of professionals. “Coming to the institute, I wanted to meet a cohort of library leaders, and I met a very bright, motivated group of people,” West says. Each year’s class uses a Facebook group to share challenges and resources after the training has ended. Sullivan added that previous years’ classes have also held reunions to reconnect. Institute participants have responded enthusiastically to the program. West says that she has encouraged staff members to apply—even recommending it to those who haven’t yet gone to library school but plan to pursue the degree. Applications to participate in the 2017 Leadership Institute can be found at ala.org/transforminglibraries/ala-leadership-institute. Participants must have at least five years of library work experience and a letter of support from their employer, and be ready to assume a managerial role. GREG LANDGRAF is a regular contributor to American Libraries. He lives in Chicago.